Work wear doesn’t have to look manly, even if you must wear a suit or trousers. You should only wear clothes that suit and fit you if you want to look amazing. Suits can look lovely if you have them properly fitted to your size and shape. You can also buy more feminine suits from high street stores. Monochrome is a safe bet for work, but can be boring. It doesn’t have to include just black trousers and white shirt. Why not wear patterns in monochrome so your clothes are visually interesting and still work appropriate? 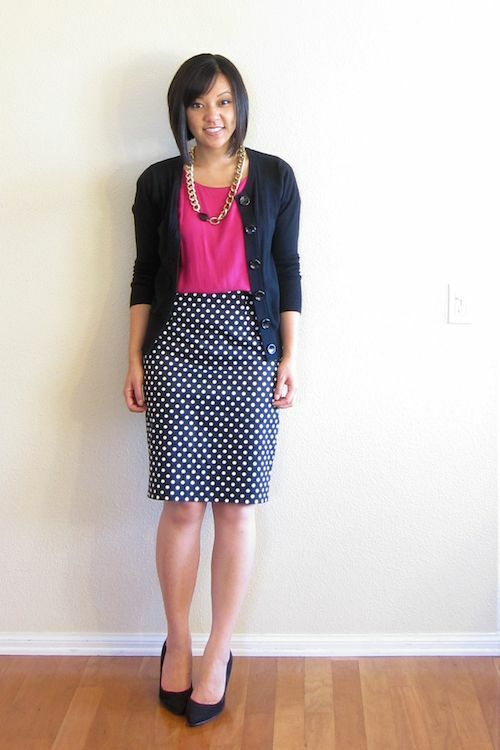 Polka dots and stripes are a great choice. To further make the most of your shape, cinch in at the waist. You obviously don’t want to go overboard by showing off too much chest or leg, but there’s nothing wrong with showing off a small waist. You can do this by adding a nice belt, or by wearing high-waisted trousers with a tucked in shirt. Feel free to experiment with your accessories when you’re putting together work outfits! You can’t go wrong, as there isn’t really a way they could be inappropriate. Obviously, you don’t want your jewelry to be too shiny or flashy. However, you can make your outfit look way more interesting with a statement necklace and a cocktail ring, for instance. Get colorful with your work outfits; there’s no reason you can’t! You can pick one bright color and then pair that color with neutrals to make it suitable for work. A hot pink blouse, for example, would look nice tucked into a black pencil skirt. You don’t want to dress too colorfully, as you don’t want your boss to get the wrong idea. Test out different textures to see if you can create some extra interest in your work outfits. Wear a fluffy jumper with your regular work trousers. Wear a loopy cardigan over your regular work blouse. Make things interesting with texture! Choose an item with an unusual cut to keep things fresh and exciting. Cowl necks are a great choice in both jumpers and dresses! The JustFab app offers inspiration for items like this. Finally, why not shop vintage for your work blouses? This way, your blouse and trouser combo will never be boring. Plus, you’ll always look different to everybody else in the office.